I shamefully copied Karen by making my dress out of crepe. Mine came from Dragonfly Fabrics and is one of the nicer crepes I’ve found. I think it’s the viscose content that makes it so soft and rather more breathable than the polyester crepes I’ve used in the past. The upside with polyester crepes is that you get that wonderful colour saturation, this is a more muted, almost heathery colour. 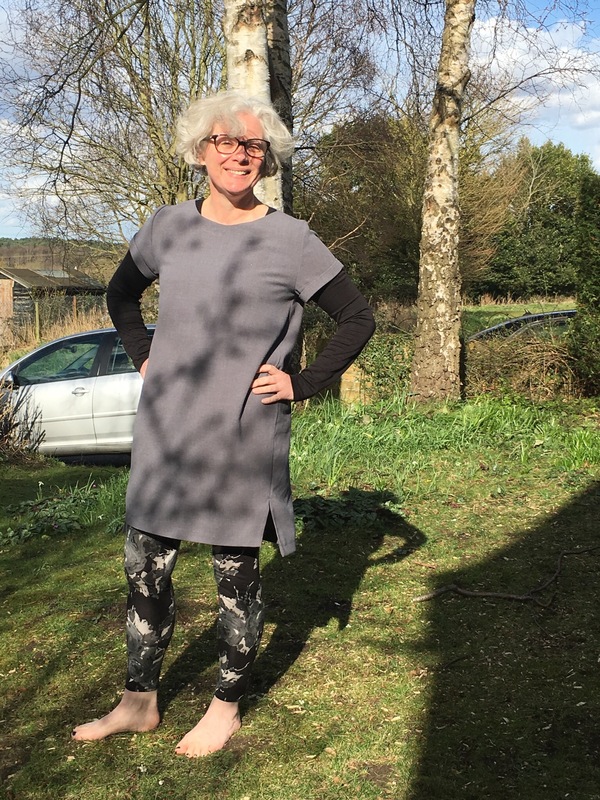 Some bloggers have commented on how the sleeves can be a bit tight on this pattern and with my muscular (ahem) arms I decided it was worth adding a couple of centimetres to the width. I also took out a couple of centimetres from my upper chest which is an adjustment I commonly require. I’m not sure this was completely necessary. So what do I think? Well I love the shape, it’s comfortable and modern is a Cos sort of way – a stylish dress for grown ups. As always the success is in the details; the cocoon shape, the seams that wrap around to the front, the side slits and change in hem length. The only thing I might change is the sleeves. The cuffs make it quite bulky under the arm and prevent me from putting a cardigan or jacket over the top, fortunately I can wear t-shirt underneath so I haven’t frozen to death yet.